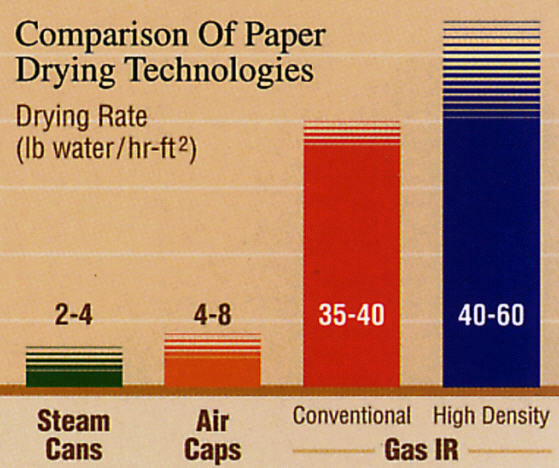 When the paper sheet enters the paper machine Dryer Section, it is about 50% water. It must be dried to less than 10% water for a finished product. The most common Dryer Sections include Steam Cylinders and Air Dyers. Infrared Dryers are most commonly used on coating lines. The purpose of this web site is to promote the increased use of Gas IR Heaters in the paper manufacturing Dryer Section. Drying occurs in Three Phases or Zones. In the Heating Phase the sheet enters at about 100F and is brought up to about 180F. Generally, about the first 5 cylinders are considered the ‘Heating Phase’. In the Constant Rate Zone, heat is added at about the same rate that evaporation is removing the heat. Most of the water is removed in the Constant Rate Zone. 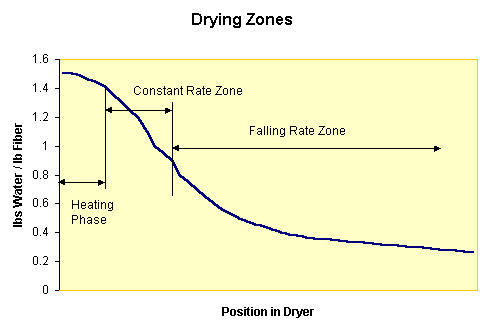 The Falling Rate Zone is the most difficult as it must remove the last 10% or so of moisture without causing problems related to un-even or over-drying. to 5 stories tall. They require 1,275 to 1,575 BTUs steam input per pound of water dried from the sheet. Air dryers are direct fired or use steam-to-air heat exchangers to produce a hot air stream that is forced over the surface of the paper. Hoods or ‘caps’ are used to contain and direct the air flow. Air dryers tend to be used on lighter weights of paper, such as tissues, and to supplement the drying of steam cylinders. A Yankee Dryer is a specific kind of dryer used most commonly for Tissue and Toweling manufacturing that combines a large steam cylinder and an air hood. The Flakt Pulp Dryer is also a special kind of air dryer that is used to dry “market pulp” (Pulp that is made in one location and sold for final paper manufacturing at another location). A Flakt Dryer is constructed in decks that the pulp serpentines through as hot air is blasted through it by a series of jets. IR Dryers produce infrared radiation from a hot surface. Different wave lengths are produced from different kinds of heaters and varies with temperature. 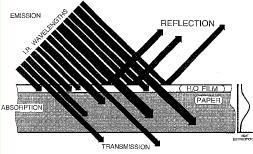 How receptive a material is to IR energy is a function of its surface reflectance and the IR wavelength. The more receptive the material, the higher the IR system efficiency. Natural Gas IR Heaters operating at about 1,800F (1,000C) produce an IR wave-length between 2 and 3.5 microns. This is also the segment that both paper and water have a high receptiveness. When the IR energy is absorbed by the surface water, its temperature rapidly increases and it evaporates. When the paper absorbs the IR, its temperature also increases and drives out the moisture from within the sheet. The net effect is a very efficient system that uses over 50% of the available energy to dry the sheet. In some applications the exhaust gas can be recovered to pre-heat incoming air and further increase efficiency. Gas IR heaters produce more drying, in a smaller space, more efficiently, than any other drying system available.